Born in Abbey on 22nd September 1821, John Conness was the youngest of 14 children born to Walter and Mary Conness (nee Williams). In 1836, at the age of 15 years he emigrated to the United States where he attended Public School in New York. In his autobiography he pays special tribute to the teachers at the Public School he attended and to the value of free public education. He worked for many years in New York but, like many others, he was attracted by the excitement of the gold rush and moved to San Francisco, California in 1849. He worked in the mines for several years and this experience was to give him a lasting interest in the mining industry and to influence his subsequent public life. Although he states in his autobiography that he never sought public office he went on to become a successful and highly regarded public representative serving as US Senator from California. He was instrumental in the establishment of Yosemite National Park and later he was honoured by having Mount Conness and Conness Creek in the Sierra Nevada mountain range named after him. 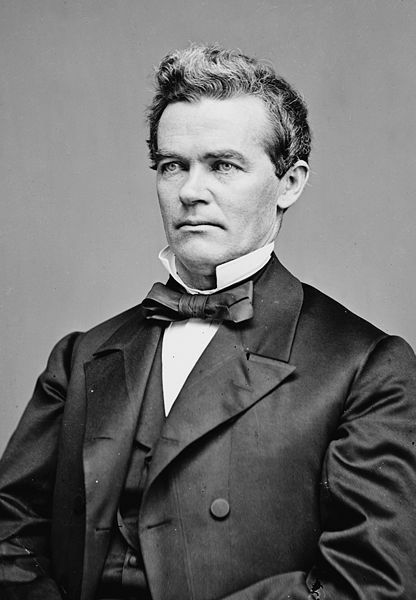 He was widely acclaimed for voting for the amendments to abolish slavery and for supporting immigration and civil rights for Chinese in California. He worked closely with President Abraham Lincoln on whose death in 1865, John Conness was honoured to be one of the pallbearers at Lincoln’s funeral. During his later years he relocated to Boston where he was part of a strong Irish American community. Although he died in the United States on 10th January 1909, his ancestors’ family burial plot is located in Abbey Cemetery. Locally referred to as the Conness Monument the tomb is the resting place of a number of the Conness family members. 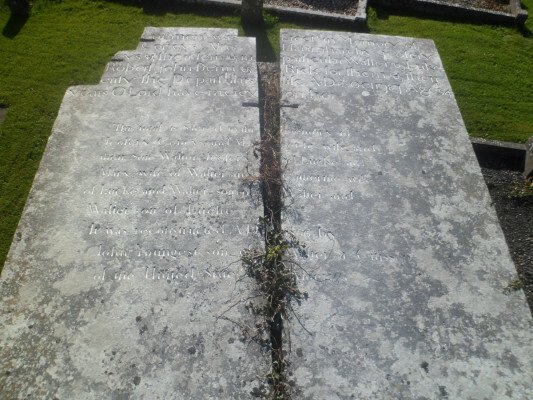 All the graves in Abbey Cemetery have been digitised recently (2014) and the inscription on the Conness tomb, which is now quite obliterated, has been recorded in records as Coneys. “…..Monument was Erectd in Memory of Coneys Alias Hanrahan by Jeofrey —eys & their Sons & in particular Walter & Luke Robert, John Benn & Rick for them & their —erity. She Departd this life AD 2d Oct 1787 Aged 54 Years O Lord have mercy on her This tomb is sacred to the memory of Jeofrey Coneys and Margret his wife and Mary wife of Walter and Catherine wife of Lucke and Walter son of Walter and Walter son of Lucke It was reconstructed AD 1866 by John youngest son of Walter a citissen of the United States of America O Man thou a creature of clay whose highest path the pilgrim’s way To strive in life and only reach the end this tomb doth plainly teach”. From local folklore it would appear that the Conness household was located in Abbey village within a stone’s throw of Kilnalahan Monastery and Abbey Cemetery. 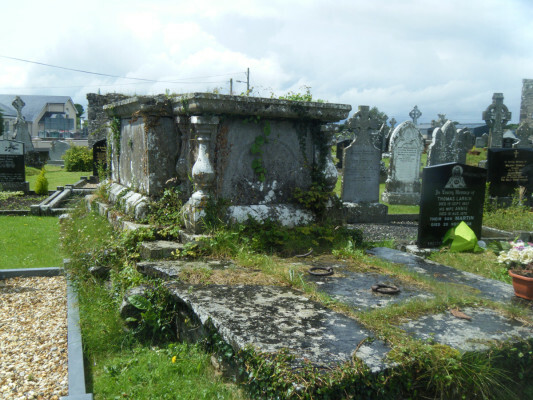 The link to the Hanrahan family is not clear but local folklore tells us that old Mrs Hanrahan always indicated that she wished to be buried in Conness’ tomb. For the record, Senator John Conness (mentioned above) was the younger brother of my great great grandfather Luke Conness. Luke emigrated to the U.S. and spent most of his life in LaSalle County, Illinois, as a farmer. He died January 1886, and is also buried in that County (in Lostland Cemetery, west of Streator, Illinois). Thank you for that update on the Conness family. Thank you John. This will be emailed to you directly. would like to have a contack for Elaine conness.i was born in Streator il. my father Robert e conness was born there in 1912.not sure where my grandfather john conness was born. You will be very welcome. Keep us updated on your plans. My husband (now deceased) is obviously a relative of John Conness. His father\’s name was Robert, his uncles John and Walter. His grandfather came from Streeter Ill. My sons Ian and Sean and I would love to come to Galway and view the tomb and meet any family there. This is what my husband wanted to do, but we never made it. My tentative plan is to come the summer of 2017 following their graduation from High School. I only hope we\’ll be welcome.